RAWspace was conceived with the notion that all makers involved in the creative process have a commonality, in that they all begin their work using a RAW material - clay, glass, paint, paper, precious metals, wax, wood, etc. • a FULLY EQUIPPED on-site jewellery studio WITH 8 benchES, offering bench rentals for the qualified jeweller, or workshops and classes for the beginner or curious. • a showroom FOR ALYSHAALEX, as well as makers who want to use the space for business appointments or to meet with clients and customers. 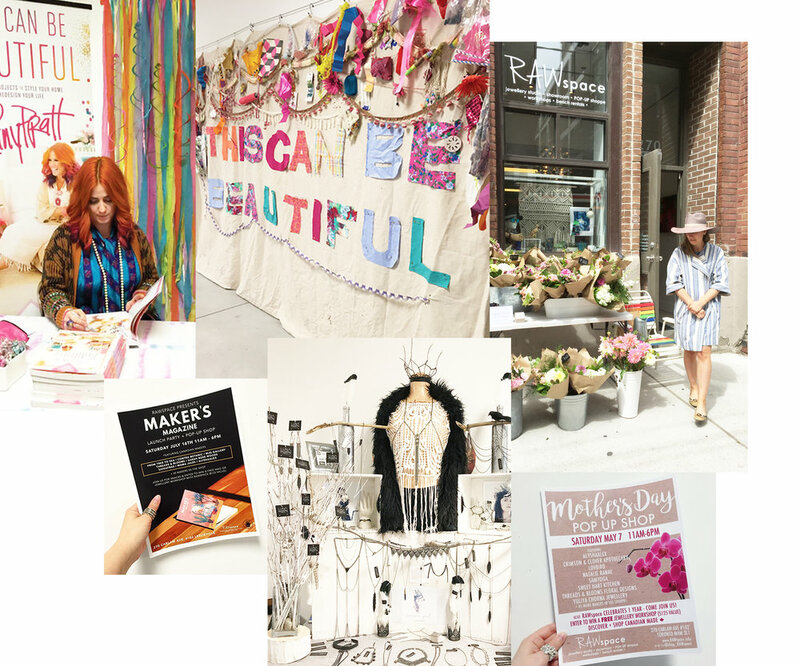 THE SHOWROOM giveS artisans the opportunity to network with other makers and shakers, and to connect with media and industry influencers. • a retail shoppe featurING the work of 45+ selected talented Canadian ARTISTS/designers/MAKERS, to sell their unique, high quality hand-made work. WE ALSO host pop-ups, and special events like magazine launches, book signings, and art shows in our gallery/shoppe. If you're looking for an intimate, unique space to hold your next event, please email us at contact@rawspace.info. is a Toronto based jewellery designer working in precious metals and natural gemstones under the brand ALYSHAALEX. Alysha is an award-winning graduate of the Ontario College of Art and Design University (OCADU), in jewellery and metalsmithing. Alysha’s work has appeared in a number of publications - both locally and internationally - and she has been featured in many galleries, exhibitions and shows in Toronto. Alysha has shown at Toronto World Mastercard Fashion Week, and her designs have adorned Canadian talent on (and off) red carpet events at the Toronto International Film Festival. Alysha's jewellery has been seen on celebrities like Victoria Justice and Lupita Nyong'o. is a Registered Art Therapist, Certified Family Mediator, and Accredited T’ai Chi Chih Instructor. She has worked in education and social services for almost 50 years both in Canada and abroad. Rochelle has served on a number of Boards and Advisory Committees in her professional fields, and has helped pioneer a number of start-up enterprises. Presently, she is the Chief Consulting Officer (CCO) for ALYSHAALEX, and co-owner of RAWspace.